The mother-to-be has a small olive stuffed into her belly. The carriage wheels are made of baby carrots and slices of olive. I got a bag of “microwavable” carrots from Publix – they were a lot smaller than the usual baby carrots. I tried to select ones that were of even thickness. To make the wheels, slice about 1/4″ rounds from small olives; slide one over each end of each carrot. The carriage hoods are colossal olives sliced in half lengthwise. Insert half a toothpick at a very steep angle, at the non-hole end of the olive. Then insert the other half of the toothpick into the meaty part of the filled egg so the hood stands up a bit. 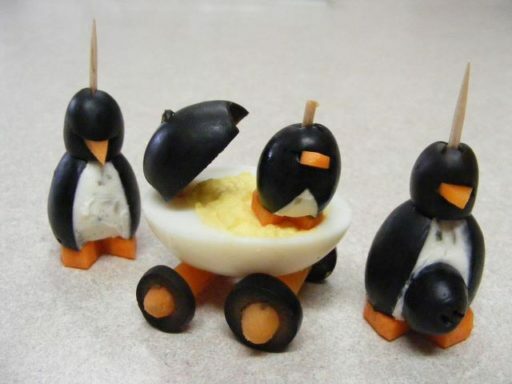 Set the egg on a set of wheels, and then put a baby penguin in the carriage. Idea: Slice a small olive on the diagonal and insert a beak. Place in the carriage… it will look like the baby is covered! Maybe even stick part of some feet to make it look like they are uncovered a little. To make these, follow the recipe and then decorate.